Aurora Cannabis announces that it's appointed longtime activist investor and Trian Partners founder Nelson Peltz as a strategic advisor. Peltz will "work collaboratively and strategically to explore potential partnerships that would be the optimal strategic fit for successful entry into each of Aurora's contemplated market segments," Aurora said in a press release. Aurora shares closed up 13.94 percent Wednesday following the release, its best day of trading since September. The company added that it has granted Peltz options to purchase 19.96 million common Aurora shares at a price of 10.34 Canadian dollars ($7.74). If he exercised the options, he would be the company's second-largest shareholder. "I believe Aurora has a solid execution track record, is strongly differentiated from its peers, has achieved integration throughout the value chain and is poised to go to the next level across a range of industry verticals," Peltz said in the release. "I also believe that Canadian licensed producers, and Aurora in particular, are well positioned to lead in the development of the international cannabis industry as regulations evolve, with a strong, globally replicable operating model." But Peltz will also prove a valuable addition to Aurora for his deep knowledge of the consumer goods industry, where he's tended to focus his investments. Current investments for the multibillion-dollar fund include a $3.6 billion stake in Procter & Gamble, an $884 million stake in packaged foods giant Mondelez and a longtime, $471 million investment in Wendy's. "We see a number of potential of growth areas, certainly consumer packaged goods," Michael Singer, Aurora's executive chairman, said Wednesday on CNBC's "Squawk Box." "The beverage industry, cosmetics, wellness; we see pharmaceuticals now starting to show interest in our space. There are a number of what we call market segments that we expect to operate in with one or many of these potential partners." The addition of the high-profile advisor increase the odds of additional strategic partnerships and is sufficient reason to upgrade Aurora's stock rating to buy, GMP Securities analyst Martin Landry told clients Wednesday. The analyst nearly tripled his price target on the company to CA$15 from CA$5.50. "Trian has been involved with a number of consumer packaged goods companies such as PepsiCo, Dr Pepper Snapple, Procter & Gamble, Kraft Foods, Heinz, Mondelez, among others," Landry wrote. "We believe he could be instrumental in facilitating discussions with large consumer packaged goods companies." Founded in 2006 by CEO Terry Booth, Edmonton, Alberta-based Aurora is one of the world's largest cannabis producers. 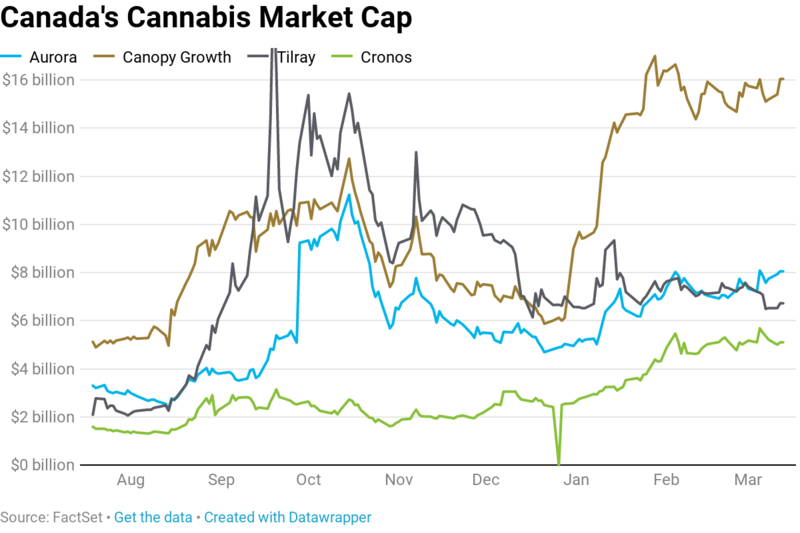 Second in market capitalization only to Ontario-based Canopy Growth, Aurora has built revenues and earnings at a dizzying pace in recent years as more jurisdictions approve the adult use of recreational marijuana. Employees tend to marijuana plants at the Aurora Cannabis Inc. facility in Edmonton, Alberta, Canada, on Tuesday, March 6, 2018. Aurora CEO Terry Booth and his business partner Steve Dobler are the largest individual holders of Canada's second-largest marijuana firm, with a combined stake approaching C$200 million. "Nelson also takes a long-term view of value creation to benefit all stakeholders," Booth said Wednesday. "We look forward to working with Nelson to further extend our global cannabis industry leadership by aligning Aurora with each of the major market segments cannabis is set to impact." Aurora shares are up more than 82 percent in 2019 and 25 percent in the past month, buoyed after leading cannabis analyst Vivien Azer initiated coverage on the stock with the equivalent of a buy rating. "Aurora is well positioned to benefit in the early innings of the Canadian adult use market, given its impressive 20 percent market share," the Cowen analyst wrote earlier this month. "The company's large cultivation footprint, capable of producing over 575,000 kilograms, provides Aurora with the necessary infrastructure to weather early storms in adult use."